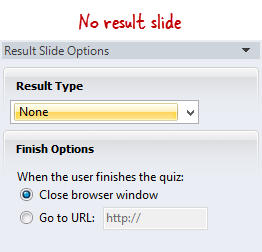 The result slide is a unique slide that appears at the end of a quiz. Its purpose is to provide learners with feedback and follow-up instructions. For graded quizzes, you can also display a learner's score and whether or not they passed. You won't have to add a result slide to your quiz. It'll get added automatically. You can, however, remove it if you don't need it. You get to edit its contents and design to suit your needs. To open the result slide for editing, switch to Question List View, and click the Edit Result button on the Quizmaker ribbon. 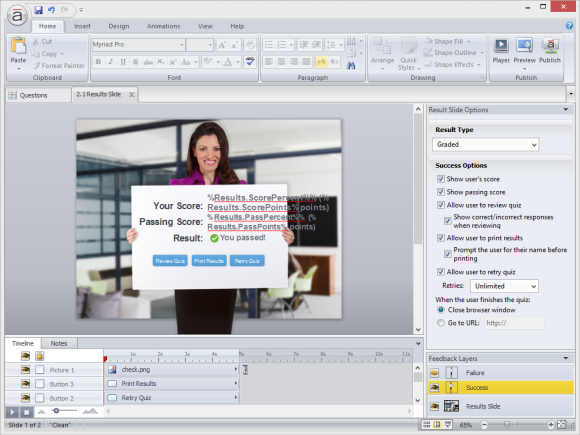 The result slide opens in Slide View for editing. 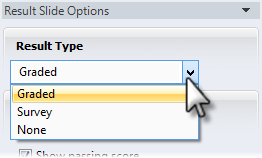 Graded: Select this option if you want to calculate a score based on the learner's responses. You can choose whether or not to display their score on the result slide (see the next section in this tutorial), but the score will always be communicated to your learning management system (LMS). Survey: Select this option if you don't need a score. 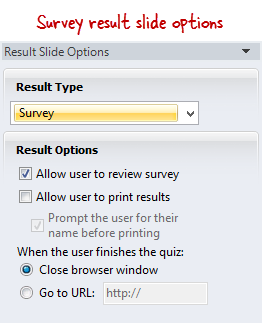 The survey result slide simply tracks whether or not the learner completed your survey. 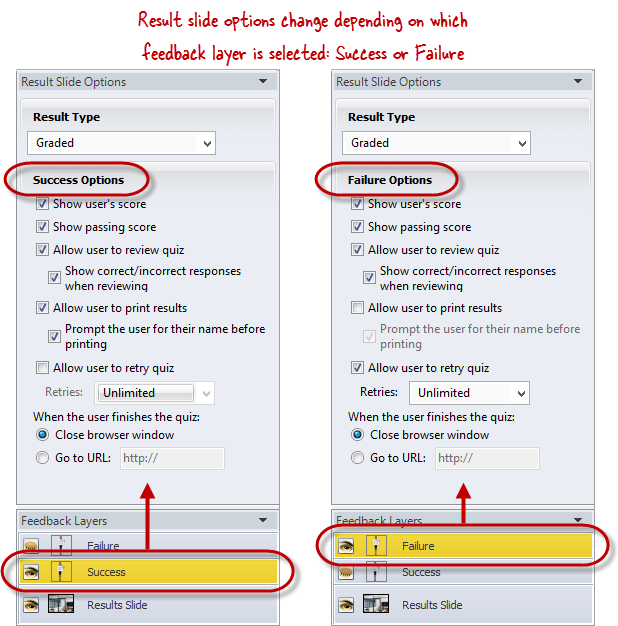 None: Select this option if you want to remove the result slide altogether. Then decide if you want the browser window (or tab) to close when the learner completes the quiz, or if you you want to direct them to a different URL upon completion. Choose your Result Slide Options in the panel on the right side of the screen. These options will be different for each Result Type (see above). Show user's score: This option adds a placeholder to your result slide that'll display the percentage and number of points learners earn. Allow user to review quiz: This option adds a Review Quiz button to your result slide. It lets learners go back and review their answers (but not change them). To also display right and wrong answers during review, mark the box to Show correct/incorrect responses when reviewing. When the user finishes the quiz: Choose what happens when learners complete your quiz—either Close browser window or Go to URL. If you choose to direct learners to another URL, enter the URL in the corresponding field. Allow user to review survey: This option adds a Review Survey button to your result slide. It lets learners go back and review their responses (but not change them).